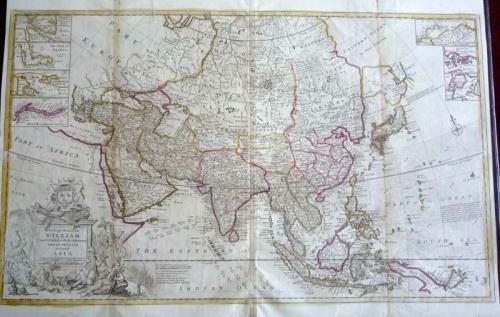 A large and elegant map of Asia with seven insets of Nova Zembla, the British factories in Chusan and Amoy, the Hellespont, the Gulf of Smyrna and the Hugli River. English nomenclature that includes notes on Jesuit explorations in the Philippines, and a notation indicating that it is not yet known whether the Northern Parts of Japan are attached to the mainland or are an island. A misshapen Japan and Korea. The various currents are shown on a monthly basis throughout the coast regions of the map. In very good condition with some toning to the folds, that are reinforced on the verso. Minor restorations. A clean and fresh image in original colour. Would frame well.